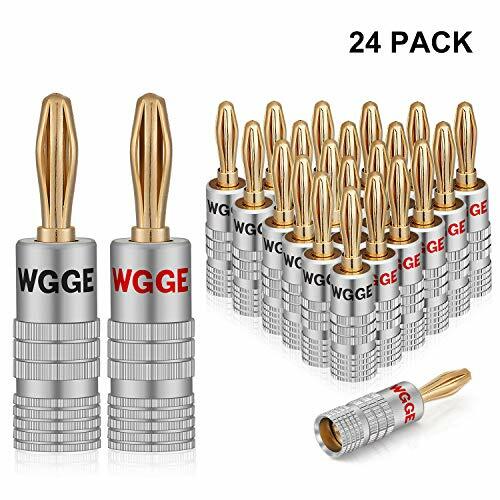 WGGE Banana Plugs Audio Jack Connector, 24k Gold Dual Screw Lock Speaker Connector for a lifetime of use, with a crystal clear signal.Double screws, when properly fastened, are said to be as effective as soldering, but clearly with much less hassle.Pure Copper, gold plated, Pure copper made, non-magnetic. Accepts wire size up to 4mm. Accepts 8AWG to 20AWG speaker wire.Double screws locking, no soldering. High quality.W&G Global Electronics Inc. mainly produce Test lead with Alligator Clips, HDMI Cables, Banana Plugs, Wire Strippers and so on. We only provided high quality and good price products to each customer. 【CLOSED TYPE DESIGN WITH DUAL SCREWS】WGGE Banana Plugs Audio Jack Connector, 24k Gold Dual Screw Lock Speaker Connector for a lifetime of use, with a crystal clear signal.Isolates wires which keep them from shorting out and the two set screws keep the wire connection secure. 【EASY INSTALLATION/MATERIAL】 Banana plugs make speaker wire installation a breeze and are great to use with A/V receivers, amplifiers, surround sound systems, banana wall plates. Material:Pure Copper, gold plated, Pure copper made, non-magnetic. 【WORKS WITH MULTIPLE SIZES OF SPEAKER WIRE】 Accepts wire size up to 4mm. Accepts 8AWG to 20AWG speaker wire.Double screws locking, no soldering. If you have any questions about this product by WGGE, contact us by completing and submitting the form below. If you are looking for a specif part number, please include it with your message.